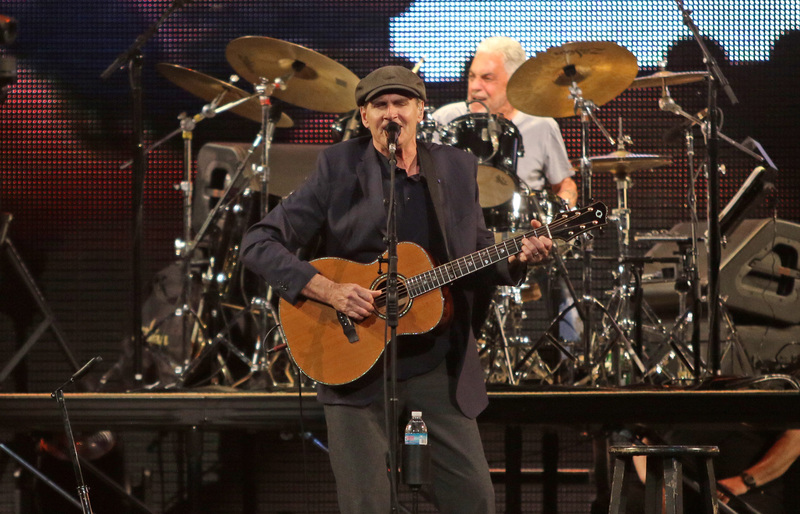 Skipping and hoping, with his earthy and crispy voice, James Taylor gracefully performed some of his new melodies and old favorites last Saturday, May 11 at BB&T Center in Sunrise, FL. His signature silky voice was a display of storytelling delivering favorites such as; Country Road, Shower the People, Mexico, Copperline, Up on the Roof, Fire and Rain and many others. Supported by the experienced and skilled musicians of his All-Star Band, which included percussion, horns, drums, bass, guitar, sax and clarinet, violin, keyboards and backing vocals, the sounds could easily be described as pure and in complete harmony. His artistry and uplifting demeanor are evident. At times we could hear a pin drop in the arena, Taylor’s performance demands a silence that comes naturally to an audience that is familiar with his music. Always a gentleman, yet Taylor is aware of his mastery and his material. He is charming and young spirited as ever. Taylor’s clean stage design and video screens backdrops was a nice complement to his performance, including colorful display of scenic views, images of his hometown and childhood, close-ups of the musicians on stage and images of his cute puppy Ting, who he made sure to introduce to the audience. Songs like “Shower The People” ignited the crowd to a sing-along as with many others, although it felt at times as if we were in a much smaller setting. It is remarkable to see how he remains so easy going as we witness him seating at the corner stage during the 20-minute intermission and make himself accessible to the fans; taking selfies and giving autographs to whoever was lucky enough to get close. He also dedicated a song to the family of victims of the parkland school shooting and held a meet-and-greet with the families after the show. Taylor has sold more than 100 million albums and has been awarded the Presidential Medal of Freedom in 2015. He has won 5 Grammy awards and was inducted into the Rock and Roll Hall of Fame and the Songwriters Hall of Fame in 2000. If you have the chance to attend his show, its one not to be missed.